Stir fry each vegetable(except cucumber) for 20-30 seconds. A teaspoon Gochujang Yangnyum over Dasima and cabbage rolls. Kombu is the Japanese word for dried sea kelp and Dasima in Korean and seaweed including dried sea kelp is widely consumed in Korea. This dish is a favourite picnic and party food and you can taste at moderately expensive Korean traditional restaurants. If you want to impress your friends or party guests then this is the dish that you can make in a short time but it is a healthy and delicious vegan dish. Gochujang is fermented chilli paste and Koreans often add some vegetable or cooked and chopped meat or seafood to make the sauce rich, less salty and taste to take another level of taste. You can use this sauce for bibimbap sauce as well as stir fry. If this sauce is spicy then add some tomato puree, for mine added 2 Tablespoons. Drain the tuna in a strainer in the sink. Make sure to break up the chunks of tuna. Mix all the Gochujang ingredients and put them aside or keep it in a jar. For the vegetables, if the Dasima is thick then boil it for 2 -3 minutes, if the Dasima is thin then just soak in cold water for 20 minutes. When finished, dry out with kitchen towel. Place 2-3 layers of cabbage leaves on a microwave-safe plate for 40 seconds. Prepare cooked rice then add sesame oil, sesame seeds, chia seeds and a tiny pinch salt then mix them well. Put aside and cover with a lid or cling film. Spread a portion of rice covering ¼ of the cabbage leaf and just roll forward, pressing gently and tightly with a mat. When the roll is complete, press inwards at both open ends and wrap with cling film. Leave for 20-30 minutes, before removing the cling film and slicing to serve. Scoop your Gochujang sauce on top of the cabbage & Dasima rolls. 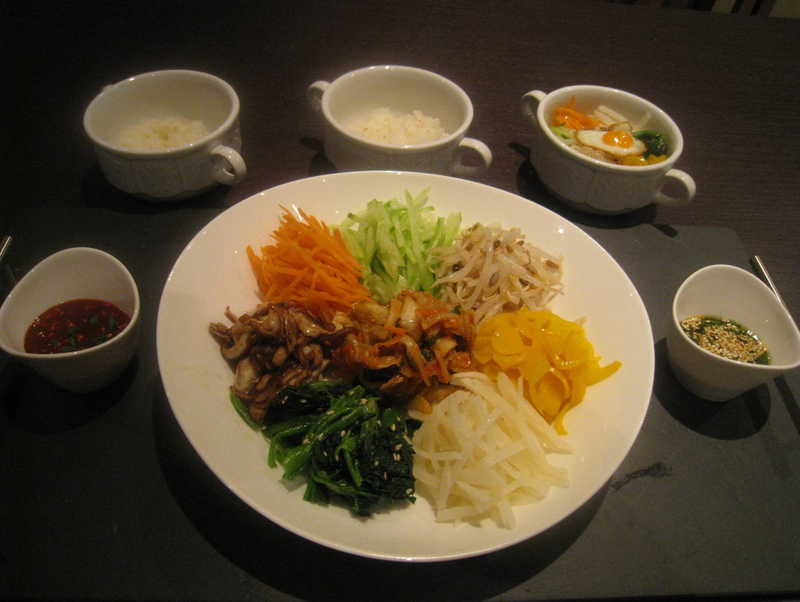 Bibimbap is made of steamed rice, assorted “Namul” (cooked and seasoned vegetables). This dish is vegetarian heaven; they might top with a choice of fried tofu, fermented Kimchi (Chinese cabbage) or cooked and seasoned mushrooms. Even non vegetarians love this dish, they can top with seasoned beef, or chicken, or seafood such as prawns or squid and a fried egg. You cannot disappoint with this dish whatever you add. Some people garnish with finely cut toasted sesame seaweed. The dish is fresh, healthy and tasty and it is fun for children since they can mix the ingredients to their own preference.